We’d love your help. Let us know what’s wrong with this preview of If You Ask Me by Betty White. Drawing from a lifetime of lessons learned, seven-time Emmy winner Betty White's wit and wisdom take center stage as she tackles topics like friendship, romantic love, aging, television, fans, love for animals, and the brave new world of celebrity. If You As It-girl Betty White delivers a hilarious, slyly profound take on love, life, celebrity, and everything in between. To ask other readers questions about If You Ask Me, please sign up. Oh Betty, you are too precious for this world. Betty White is a true American icon - she's simply magnificent from her candy-floss hair to her tippy-toes. Betty White disperses advice and anecdotes in her novel - anywhere from her success to her pets to aging in Hollywood. I absolutely adored this novel - Betty is hilarious and an absolute doll through and through. I loved her attitude when she talks about animals and why they are so important to her life. In addition, I really enjoyed how Betty talks about getting older and loving it. So you may not be as fast on your feet, and the image in your mirror may be a little disappointing, but if you are still functioning and not in pain, gratitude should be the name of the game. Betty White read her novel - and she is the best. Back in the sixties, there was a man on our block who worked at a television studio as a stage hand. He once told me that there was a lot of dead time during the shootings while he waited to change the sets. The guys would go over to the studio where they were filming the TV game show Password. The attraction: watching Betty White cuss and swear between takes. He told me, "She really has a mouth on her but she is so sweet and funny it's hilarious." When a friend loaned me this book, I thought it Back in the sixties, there was a man on our block who worked at a television studio as a stage hand. He once told me that there was a lot of dead time during the shootings while he waited to change the sets. The guys would go over to the studio where they were filming the TV game show Password. The attraction: watching Betty White cuss and swear between takes. He told me, "She really has a mouth on her but she is so sweet and funny it's hilarious." I once met a person who did not like Betty White. I just wanted to get that out of the way as it seems everyone is asking if there is anyone who does not like Betty White. Yes there is, but I am not one of those rebellious hearts, but go with the general flow and adore her to death. Betty White is a sweetheart, she is the kind of woman you could listen hours while knitting and solving word puzzles. It would be all cozy, a really nice time and you would probably feel a lot older than she is even no I once met a person who did not like Betty White. Betty White is a sweetheart, she is the kind of woman you could listen hours while knitting and solving word puzzles. It would be all cozy, a really nice time and you would probably feel a lot older than she is even no one is older than she is. Damn, that woman is dynamite with good genes. If You Ask Me is one of those books that makes you feel all good and fluffy. There is stories about the stardom and red-carpets, working in the industry, some levelheaded advice, a lot of love towards animals, quirky habits and interests, stories about the girls, and stories about THE GIRLS. And you just smile and eat your cookies in a sunny weather (even when in reality it is freezing and dark outside with a spoonful of snow) while turning the pages. It is all really nice and sweet, and you just adore Betty White and want to do a marathon of The Golden Girls afterwards (which is what I did, bless her). But, who Betty White really is, is always there under the surface, never really raising up to reach out to you. Maybe closest you ever get to her is when you see her stories through the animals, occasional sentences here and there. First off, is there anyone who doesn't love Betty White? You show me that person and I will...oh you don't want to know what I'll do! There's no room on this planet for haters of lovely old ladies! Hold me back! I'm not responsible for my actions! If you don't love her book, well, that's another thing. Her latest autobiography If You Ask Me, is a slim volume that relates a few enjoyable anecdotes about showbiz, gives advice on acting, and talks about her love of animals. There's nothing earth-shat First off, is there anyone who doesn't love Betty White? You show me that person and I will...oh you don't want to know what I'll do! There's no room on this planet for haters of lovely old ladies! Hold me back! I'm not responsible for my actions! Her latest autobiography If You Ask Me, is a slim volume that relates a few enjoyable anecdotes about showbiz, gives advice on acting, and talks about her love of animals. There's nothing earth-shattering here and you'll probably only find yourself chuckling at a few of the passages, but regardless it's still an overall good read and I'm not 100% sure why. What can I say, the woman is charming. I grabbed this from the library after seeing my friend HFK's review a week or so ago when I was looking for something new to listen to on the drive to and from work. This fit perfectly into my 15-20 commute window and I was able to finish it in just a couple of days. While there's nothing real deep about this selection, if you like Betty White - you should like it just fine. And if you don't like Betty White????? "...“Animals don’t lie. Animals don’t criticize. If animals have moody days, they handle them better than humans do.”..."
"...“It’s [old age] not a surprise, we knew it was coming – make the most of it. So you may not be as fast on your feet, and the image in your mirror may be a little disappointing, but if you are still functioning and not in pain, gratitude should be the name of the game.”..."
The book is just snippets and opinions, a lot about her love for animals and some about her passion - showbiz! Enjoyed a lot, but I was hoping for a bit more... Still, if you are a fan of Betty, everything she writes is a treat! "...“That’s when you have to remember that image in the mirror and not let success get to you. It is important that you not believe your own publicity. Be grateful for whatever praise you receive, but take it with a grain of salt.”..."
If you Ask Me: And of Course You Won't narrated by the author, Betty White, is simply delightful. She talks about all kinds of different subjects, but the majority of them involved animals and how much she loves them. And I love that about her. The only flaw I found with this is that it was too short. I love you Betty, but I needed more! 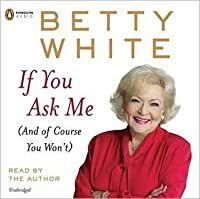 If you adore Betty White, then I highly recommend you listen to her narrate this audiobook! Awwwww, Betty White. I haven't had grandparents in years and I want her! She loves animals possibly more than I do and she has a room full of stuffed ones (not taxidermied!). She tells them that she loves them. Out loud. Then again, Cloris Leachman would be a good grandma too. She might have a room full of liquor that she talks to. My favorite anecdotes were the ones from the proposal, the time she locked herself out of the house, and about her animals. Guaranteed to make you miss your grandmother. This audiobook was the bees knees, Betty did a stellar job and I'm not surprised this won a Grammy for Best Spoken Word Album in 2012. I got misty eyed more than once, and hearing Betty's voice break as she recounted when Butterscotch the horse "had galloped on," was just heartbreaking in a sweet way. Super short book, I now have an irresistible desire to watch something with Betty White, specifically You Again, and The Propos Guaranteed to make you miss your grandmother. My God, I love Betty White. I already finished one book today, cracked into this one and found that I could not go to bed until I finished it. Not so much a memoir (she's already written 5 of those), but more like little topics that she reviews. She's adorable. A couple of things made me sad. 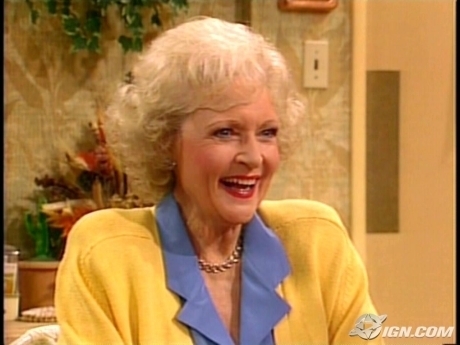 A) In talking about age and how it shouldn't bother you, she says that Estelle Getty was TERRIFIED of getting old and sick, to the point that the writers of Golden Girls had to be careful of the kind of jokes My God, I love Betty White. Who doesn't love Betty White? I mean does anyone actually dislike her? If so...why? I can remember watching Betty White on TV when I was a kid (sorry Betty but there aren't many performers I can still say that about) and she's just a sharp and just as funny (unless of course she's doing drama) as she ever was. This book is more a book of quick reminiscences on her life and then comments on what's going on NOW in her life. We get a lot of vignettes about various parts of her life (I'd say especiall Who doesn't love Betty White? I mean does anyone actually dislike her? If so...why? This book is more a book of quick reminiscences on her life and then comments on what's going on NOW in her life. We get a lot of vignettes about various parts of her life (I'd say especially her relationships with animals). This was a cute story that took me very little time to read, because it is so short. The book was short, simple and cute. There wasn't anything really eye-opening or super special about this book, but I did find it interesting when she talked about her love for animals and all the volunteering and adopting of pets that she does. This book was written like an interview. It's Betty White, what's not to love! I listened to this on audiobook and it was fantastic, I loved hearing Betty talk about her experiences, she is a wonderful human being. I would for sure recommend this book for a little inspiration, some laughs, and for an overall enjoyable experience! Another celebrity memoir. I just love these on audio. I listened to this little book today while I was cleaning my house and found it to be very entertaining and even sweet. Don't expect any mindblowing revelations about life or even her life but it was very nice to listen to. I got the feeling that even if there was nothing in particular she wanted to bring across, Betty White just really likes to write. That's why she tells us about some of her friends and co-workers, experiences in the show b Another celebrity memoir. I just love these on audio. I listened to this little book today while I was cleaning my house and found it to be very entertaining and even sweet. Don't expect any mindblowing revelations about life or even her life but it was very nice to listen to. I got the feeling that even if there was nothing in particular she wanted to bring across, Betty White just really likes to write. That's why she tells us about some of her friends and co-workers, experiences in the show business, her animals. Basically, just was life has been like for her these past years. I have loved Betty White since I used to watch her and the wonderful ensemble of ladies on The Golden Girls when I was just a child. Her character Rose was always my favourite because she was so naive and sweet (and funny, obviously) but there was a lot more to her than initially met the eye. In these past couple of years, Betty White seems to have become some sort of icon and if you have seen interviews with her, you know she is a delight. This woman is hilariously funny, quick-witted, and has impeccable comedic timing. She is also a great animal lover, and all in all seems like a genuinely nice person, who works hard but makes it look easy, doesn't take any nonsense, and is very down-to-earth. A fun, short bit of Betty White's life. I didn't expect anything more than a feel-good set of anecdotes & that's what was delivered. I hadn't realized she was so into animal rescue & that was nice to find out as were her times with Coco the gorilla & a couple of whales. Good stuff, kind of a quick draft of good clean fun to cleanse the palate from the last book I read. I love reading through comedians autobiographies, they are usually so light and fun they are great breaks between really dark books – and I’ve hit a few of those recently. Betty White is such a kind person, and so funny, I loved listening to her audiobook. It’s a really short book, the audio was only 2.5 hours long and since I listen at 1.5X it went through in a little over an hour. It didn’t go into much about her childhood or anything really before she was on Golden Girls, most of it has to do w I love reading through comedians autobiographies, they are usually so light and fun they are great breaks between really dark books – and I’ve hit a few of those recently. It didn’t go into much about her childhood or anything really before she was on Golden Girls, most of it has to do with her recent commitments and her recent work. I love getting to know peoples quirks and weird habits – and this book didn’t leave me wanting. She’s an animal fanatic, she’s donated a ton of money to conservation and animal welfare and she refuses to be a part of any movie with even the slightest bit of animal abuse. Not even As Good As It Gets – she turned down a role in that movie because a dog is put down a garbage chute. The dog is fine, it’s supposed to be a funny scene, but she didn’t find it funny. She also talks to her dolls. She has a huge collection of dolls and describes them as her friends with their own personalities. Honestly, that was bizarre to read about, but to each their own – whatever makes you happy, girl! I loved her story about how she got involved in Hot in Cleveland, she was only supposed to be in the pilot because her schedule was just so insane she couldn’t make it work for more episodes. But, she loved working with the cast and the director (I think) kept begging her to stay on for just a few more episodes – and she ended up doing 124 episodes! Hard working woman! If you like Betty White, and you want a quick light audiobook or book to read through to cleanse the palate and clear the mind, I do recommend this book. It’s a book that will leave you with warm fuzzies. Betty has a pretty impressive resume. She's an actress, writer, comedian, puzzle solver, stuffed animal collector, animal rights activist and has lived to see a lot of the world change. However, this lighthearted memoir is just a small piece of Betty. 2 stars on audio. 1 star content. 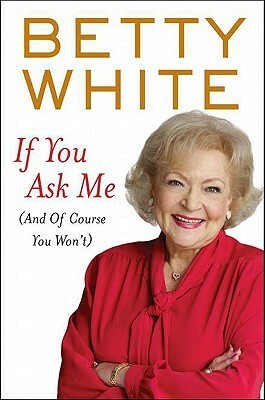 From the book jacket - Seven-time Emmy winner Betty White’s wit and wisdom take center stage as she tackles topics like friendship, romantic love, aging, television, fans, love for animals, and the brave new world of celebrity. I feel a little mean not liking this more. I love Betty White, and some of the essays in this book are spot on perfect. But it’s pretty lightweight in substance, and I felt a little like I was on one of those obligatory visits to an elderly relative when I was From the book jacket - Seven-time Emmy winner Betty White’s wit and wisdom take center stage as she tackles topics like friendship, romantic love, aging, television, fans, love for animals, and the brave new world of celebrity. I feel a little mean not liking this more. I love Betty White, and some of the essays in this book are spot on perfect. But it’s pretty lightweight in substance, and I felt a little like I was on one of those obligatory visits to an elderly relative when I was a kid … I sat politely and tried not to fidget, but all I could think of was when I’d be able to go play. It’s a very fast read, and includes several photos. Still, giving credit where credit is due, White is a lovely woman and has a keen sense of humor. There were sections that were completely delightful. I’d love to have her at my table at a dinner party! It just didn’t satisfy what I look for in a reading experience (yes, even from a celebrity memoir). I’ll continue to watch and enjoy her performances, but I’ll read something else. It was really fun to hear these humorous and poignant anecdotes read by the author, who used her great sense of timing and easy way of expressing herself through each segment and story. This book was enjoyable and informative. It was neat to hear stories about Betty White from the various eras she's lived through. From the beginning of television and her passion for animals to computers and friendships and her career, Betty White shares her heart and humor with the listener as if they were the c It was really fun to hear these humorous and poignant anecdotes read by the author, who used her great sense of timing and easy way of expressing herself through each segment and story. This book was enjoyable and informative. It was neat to hear stories about Betty White from the various eras she's lived through. From the beginning of television and her passion for animals to computers and friendships and her career, Betty White shares her heart and humor with the listener as if they were the closest of friends. She's quirky and sweet and very caring, not to mention grateful for her experiences, career, and the people and animals around her. It was great to get this inside look at so many different aspects of her life. I enjoyed hearing Betty White narrate this book of disparate essays, sort of like hearing your grandmother talk about her life, dispense a little advice and maybe chide you for sweating the small stuff. There aren’t any great revelations or aha moments, but you can appreciate this woman’s joie de vivre and the gratitude she feels for a life well-lived. This lady is absolutely amazing and no one will tell me otherwise. How could I not give her 5 stars? And it was the best day of my life. I hope this doesn't constitute cheating, but I didn't actually read this book. It is in audio book format and I listened to it on a trip last weekend. What makes it super-awesome though, is that it was read by the author herself, Betty White! "If You Ask Me" is a collection of the author's thoughts on many different subjects. She talks about Hollywood, health, and my favorite subject, pets. You really get to understand what a down to earth person Betty White is. She discusses the Mary Tyler Moore I hope this doesn't constitute cheating, but I didn't actually read this book. It is in audio book format and I listened to it on a trip last weekend. What makes it super-awesome though, is that it was read by the author herself, Betty White! "If You Ask Me" is a collection of the author's thoughts on many different subjects. She talks about Hollywood, health, and my favorite subject, pets. You really get to understand what a down to earth person Betty White is. She discusses the Mary Tyler Moore Show, the Golden Girls and Hot in Cleveland. You get to hear her feelings about Saturday Night Live and the Snickers commercial. There are tons of funny and touching stories! I wasn't sure if I was going to enjoy listening to a book, but I really did! One of the perks to an audio book is you know exactly what the author's inflection is. I often wonder if I misread certain things and don't get the full understanding of what the author is saying. Not so in this situation. You get the story exactly as it should be told, not just your interpretation of it as you read. Whether you pick up the traditional book or the audio version, you'll get wonderful insight from a funny lady who has seen a lot in her life! I love Betty White. Unfortunately I missed her birthday special recently so instead, I watched a ton of Youtube videos of her, in current and old roles, on Inside the Actors Studio, on old game shows, etc. This book was a short, cute read about her life, written in 2011. It was a very quick read but I really felt myself wanting more. I wanted more substance as well as more of her humor in the writing, and while there is some, it fell short of my expectations. That's probably the problem: my expec I love Betty White. Unfortunately I missed her birthday special recently so instead, I watched a ton of Youtube videos of her, in current and old roles, on Inside the Actors Studio, on old game shows, etc. This book was a short, cute read about her life, written in 2011. It was a very quick read but I really felt myself wanting more. I wanted more substance as well as more of her humor in the writing, and while there is some, it fell short of my expectations. That's probably the problem: my expectations. I am glad I read this though - it definitely gives you a window into White's mind. She is an amazing, inspiring woman, still going strong at 90. If I could have even half of her energy I'd be happy! "Bets, you can lie to anyone in the world and even get away with it, perhaps, but when you are alone and look into your own eyes in the mirror, you can’t sidestep the truth. Always be sure you can meet those eyes directly. Otherwise, it’s big trouble, my girl." Okay, so I’m weird. At least I am in good company. The trainer, whose name is Dennis Christian, asked if I would like to meet their beluga whales. How is that for the silliest question ever? All my life, even as a kid, I have preferred men older than I am. Unfortunately, today I don’t think there is anyone older than I am! Even at this age, once in a while I meet a man who seems a trifle more interesting than usual. Nothing untoward—just someone who might be fun to know a little better. I’ve even thought (to myself) that it might be nice if he asked me to lunch or dinner, perhaps. Then reality kicks in and it cracks me up. This guy is probably a much younger man—maybe only eighty—and not about to even look my way. This book was a very short read for me. I picked it up, because I am a huge Betty White fan. It was not Earth Shattering, but I didn't expect it to be. It was short biographical blurbs. Pros: Betty White photos. Betty's love for animals that bleeds through the pages and are mentioned in over half of the book. Betty's witty personality. Cons: Formatting, formatting formatting. For the conservation effort that Betty feels for the environment, you would think that she may have had a problem with the This book was a very short read for me. I picked it up, because I am a huge Betty White fan. It was not Earth Shattering, but I didn't expect it to be. It was short biographical blurbs. Cons: Formatting, formatting formatting. For the conservation effort that Betty feels for the environment, you would think that she may have had a problem with the waste of paper that was put forth with this book. In order to make the book appear to be long the margins were so huge if you put both sides together it would be equal to or more than the space that the writing occurs. Instead of letting a short passage BE short, they tried to stretch it out. There were several instances in the short book that the same anecdote was mentioned almost verbatim two or three times. There would be at least 1 blank page per chapter. Betty spends at lot of the book explaining her busy schedule and how she probably shouldn't have written this book, but couldn't say no. To say that Betty White's latest book—I suppose we should call it that, as it's tough to deny that it got printed and appears on bookstore and library shelves—is a bit random and scattered, is an understatement. To imply it's a lot like listening to your aged grandmother ramble about the good old days when she's in a talkative mood, would be unkind. To suggest that it's not great literature, or even really readable. . . well, that's kind of missing the point. I was able to complete this slight l To say that Betty White's latest book—I suppose we should call it that, as it's tough to deny that it got printed and appears on bookstore and library shelves—is a bit random and scattered, is an understatement. To imply it's a lot like listening to your aged grandmother ramble about the good old days when she's in a talkative mood, would be unkind. To suggest that it's not great literature, or even really readable. . . well, that's kind of missing the point. I was able to complete this slight little tome in an hour. White's oddball collection of mini-essays reads more like a handful of dictated and unedited blog entries than any kind of memoir. She discusses her health (which is great for her age—she tries to maintain her weight, you know, and all those stairs in her home really keep her exercised! ), her guest appearance on Saturday Night Live (it was fun! ), and her pets (she had a lot! ), and . . . oh damn, I've gone and given away the entire plot of the book. Whoopsie. Betty White is an American five-time Emmy Award-winning film and television actress with a career spanning sixty years. She also appeared in radio programs, movies, theater, commercials, and was also a talk show and game show host. White is perhaps best known for her roles in the sitcoms The Mary Tyler Moore Show and The Golden Girls.